In Honduras, the indigenous Lenca communities are carrying on the work of renowned activist Berta Cáceres by defending their territory from energy and mining projects and by building an autonomous health care system. 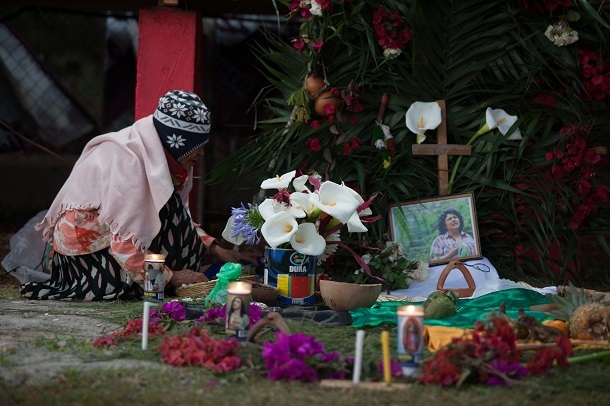 On March 2, hundreds gathered in Honduras to commemorate the life and work of the renowned Honduran activist Berta Cáceres on the second anniversary of her assassination. 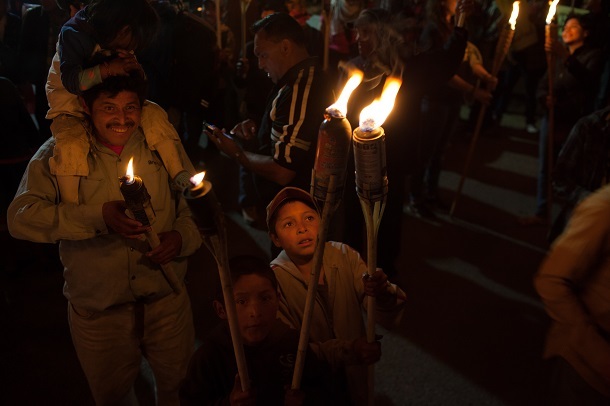 Carrying torches, Cáceres’ supporters marched to the city center of La Esperanza to demand justice for her 2016 assassination. The march was made up of students from the Honduran National Autonomous University, families from the communities organized by the Civic Council of Popular and Indigenous Organizations of Honduras, or COPINH, which Cáceres founded in the early 1990s, as well as international supporters of the late environmental activist. As the indigenous Lenca communities of western Honduras commemorated Cáceres, Honduran investigators announced the arrest of David Castillo Mejia, who Honduran authorities accuse of being the intellectual author of the assassination. Castillo Mejia, a former U.S. trained soldier, was working as the CEO of the energy firm Desarrollos Energeticos, which was building a hydroelectric project in the community of Río Blanco. The arrest is a step forward in obtaining justice for the high-profile assassination, but it falls short of identifying the true intellectual authors, who many believe are connected to the administration of Juan Orlando Hernández. Months before the assassination, Cáceres’ name appeared on a hit list distributed to Honduran security forces. 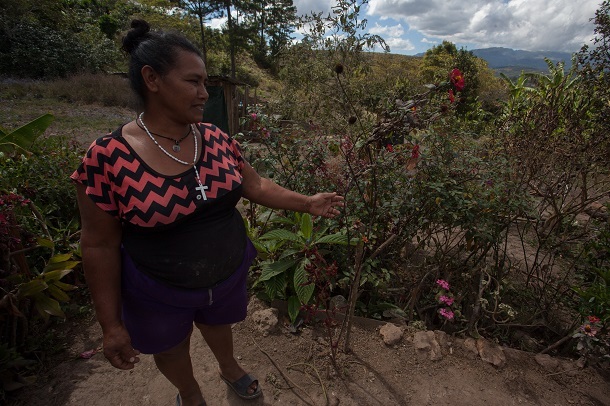 A Catholic mass was held the day after the march to remember Cáceres and her dedication to challenging capitalism and patriarchy in Honduras, as well as across the region. The assassination of Cáceres by Honduran state forces dealt a great blow to the movement of the Lenca people. But the communities have remained organized to continue the work that Cáceres began. Since the founding of COPINH in 1993, Berta Cacéres and the other members of the organization have gained international notoriety for their work to defend the environment from the advancement of capitalist development that favors extractive industries. In 2015, Cáceres won the prestigious Goldman Environmental Prize. But the group has also worked diligently to build autonomy for the Lenca people and defend the Lenca territory from the expansion of energy and mining projects in the region. The Lenca territory extends through western Honduras. These departments have become ground zero for the expansion of mega-projects over the nine years since the 2009 military coup d’état that ousted the democratically-elected President Manuel Zelaya. The construction of the 21.3 megawatt Agua Zarca hydroelectric project on the Gualcarque River near the community of Río Blanco brought great concern for residents. They mobilized to challenge the project over the effects to their lands by holding protests at the construction site and blocking roads. Yet the Honduran government deployed the military to protect the project. Desarrollos Energeticos had received financing from three international banks, Dutch bank FMO, Finnish finance company FinnFund, and the Central American Bank of Economic Integration, for the Agua Zarca dam. But following the assassination of Cáceres, investors announced in 2017 that they were withdrawing their investments. The Agua Zarca project is not the only project proposed for the Lenca territory. According to Zúñoga Cáceres, there are over 40 hydro projects and several mining projects proposed in the region. COPINH has supported the communities struggling against projects through the blocking of highways and organizing protests against their construction. This organization within the communities is further strengthened through the participation of the ancestral authorities, the indigenous governments that once administered in Lenca communities. All this work has contributed to the ultimate autonomy for the Lenca. By defending their land and nature as well as recuperating land, the Lenca people have laid the foundation of an autonomous system that reflects the knowledge and understandings of their ancestors, while also strengthening their self-determination as indigenous peoples. This process represents the next step for the communities in the defense of their territory. Among the key efforts is the construction of an autonomous health care system that reflects their ancestral knowledge as well as needs of the Lenca communities. Honduras faces a health care crisis. Across the country, health centers regularly lack medicine and well-trained doctors. The high costs of health care also prevent many Hondurans from gaining access to medicine. This situation is far worse in rural areas, especially indigenous zones, where residents often lack basic access to health care and face intense racism from health care providers. The need for the health program also arose from the situation that many members of COPINH faced within the communities, as well as in national hospitals. In some communities, such as Río Blanco, members of COPINH were ignored by health representatives, and in other areas patients faced discrimination because they were indigenous. “The Lenca people have always been marginalized,” said Zúñiga Cáceres. In the past, COPINH has signed agreements with various governments of Honduras to improve the access to health care for the Lenca people. These efforts have led to the opening of health centers and improvements to the roads. Yet many communities still lack access. Faced with the national crisis and historic discrimination, COPINH has promoted the construction of an autonomous health care system that will provide health centers and health care providers in rural Lenca communities. Over the years, COPINH has also sought to recuperate the ancestral knowledge of the medicinal plants, which are key to the promotion of a Lenca health care system. The construction of this autonomous system is currently in the early phases, with proposals to build six health centers to serve at least nine communities. These regions have also received trainings — and are experimenting — in the use of medicinal plants. Efforts began in 2016 when a small group within COPINH began the process, along with the assistance of the Colectivo Latinoafricano, which was formed by a group of students from across Latin America and from different professions that studied in Cuba. The collective works alongside communities in resistance across the region in popular education and formation of autonomy. The group included Pascuala Vasquez, a 76-year-old Lenca spiritual guide and member of the ancestral council. She has worked tirelessly to recuperate knowledge of plants within the communities, as well as the Lenca spirituality. The project also works to empower the women of the communities. The initiative led to the establishment of the group Lenca Women in Resistance for Natural Ancestral Health, which is made up by the women from the communities of La Jarcia, Río Blanco, La Cuchilla, Guachipilín, Mesitas, and Candelarita that were given the opportunity to be health representatives. They work alongside COPINH, along with support from the members of the collective to learn how to use local plants — such as the small shrub known as rue, rose plants, and the colorful flowers of the Achillea plant — as medicine. The emphasis on natural medicines reflects the deep connection between the Lenca autonomous health care system and the protection of nature, as the initiative draws heavily from ancestral knowledge of plants and the Lenca spirituality. The project may reflect the local needs and knowledge of the Lenca communities, but it also has an international aspect as well. The health program connects the women to a regional network of healers that utilize natural medicines to treat illness. Since the beginning of the program, the community health representatives have had the opportunity to exchange experiences with members of the network of ancestral healers known as Tzk’at from Guatemala. These meetings have helped spur the creativity of the women receiving training in autonomous health care. In one such case, Jessica from the community of La Cuchilla returned from a meeting in Guatemala and began producing a medicinal ointment that relieves pain, following the training she received during her trip. After tinkering with the recipe, she developed an ointment which today she sells to other members in the community and at events with COPINH. But Jessica has had to overcome the stigma that comes with working with natural medicines within the indigenous community. “If someone saw me cutting these herbs, they are going to accuse me of being a witch,” she said. The health project has an especially important meaning to the residents of La Jarcia. Just a week before the assassination of Cáceres, the community was forcibly evicted from their land by the Honduran National Police, investigators and the military. The residents were left on the street as the state forces destroyed their modest houses. Today the community of La Jarcia is home to around 25 families, and is advancing quickly with the construction of an autonomous health center. They worked collectively to make a thousand adobe blocks the building. Once it is complete, residents of the small community will no longer have to make the trip to the nearest town to gain medical attention, and pay high costs for medicines.